Have you ever wondered how disposable diapers hold so much liquid? You might be surprised to learn that these highly absorbable, throwaway diapers container hydrogel – that’s the same stuff you can buy in gardening stores, usually labeled as water retention crystals or something similar. They work because each little crystal swells up like a sponge, keeping in moisture. For this reason, helping your plants grow with diapers is extremely plausible. Interestingly, hydrogels are also extremely effective as an additive in high-tech bandages, often used for burns or severe scrapes and abrasions. When using diapers in containers, start with the cheapest diapers at your local big box store. Otherwise, you may be better off just buying expensive gels at your garden center. Tear open a diaper and dump the contents in a mixing bowl. Don’t bother picking out the little cottony bits – they absorb water, too. Add water until you have a thick gel, then mix in equal parts potting soil. Put the stuff in a pot and you’re ready to plant. If you don’t want the fuss and muss of ripping into the diapers, just peel away the layer that goes against baby’s bottom, then place the entire diaper in the bottom of a container, with the plastic side facing down. If the container is large, you may need more than one diaper. 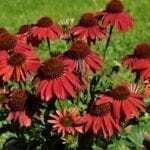 Be sure to poke a couple of holes in the plastic so the potting soil can drain; otherwise, you may end up with root rot – a disease that is often deadly to plants. 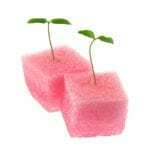 Is the Use of Diapers for Plant Growth Healthy? You don’t need to be a chemist to understand that hydrogels are not natural materials. (They are actually polymers.) Although a diaper here and there probably won’t hurt a thing, it isn’t a good idea to use them excessively because the chemicals, which may contain carcinogens and neurotoxins, will leach into the soil. Similarly, using diaper filling for moisture control isn’t a good idea if you’re growing vegetables in containers. People who are interested in sustainable, environmentally friendly, organic gardening usually choose to and forgo benefits of chemicals – even the type that come from baby diapers.